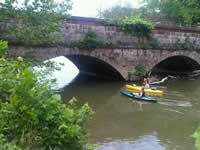 A few minutes walk downstream from the Great Falls, you'll find a picturesque white structure above the canal. 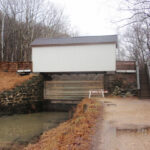 It looks like a covered bridge; however, it's an important piece of canal engineering called a stop gate. 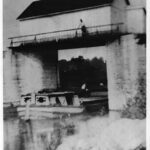 Stop gates were built to help protect the canal downstream from flood waters. At Great Falls, flooding usually occurs above Great Falls, as the waters of the Potomac River cross the towpath and inundate the canal. If left alone, this wall of water would continue down the canal and threaten miles of canal locks, levels, and communities built around them. 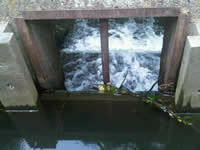 In the event of a flood, the stop gate can be lowered, creating a wall to divert water back into the river, thus protecting the canal downstream. This particular stop gate was originally built in 1852. If you look at the stone walls of the stop gate, you can still see the original groove that the boards slide into. 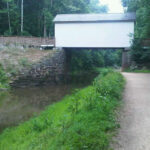 Above the stop gate is a structure that most people think must be a covered bridge. Rebuilt in 2009, the building houses the working parts of the stop gate - the boards used to create the wall and a modern winch system to lower and raise them. 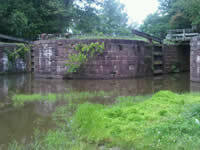 The C&O Canal has suffered from many floods throughout its history. 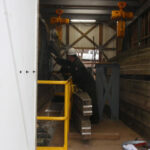 The use of seven stop gates reduced the damage caused by those floods and prevented additional devastation. Flooding continues to be a concern today, and the stop gate at Great Falls is still lowered before big flood events. In that way, the canal continues to play a role in protecting communities downstream. 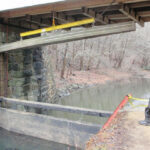 I welcome you to come out and visit the stop gate (not a covered bridge) at Great Falls. The surrounding area of the stop gate, usually quiet and idyllic, is a great place to escape the hustle and bustle of the busier sites. That is, unless the park is anticipating a big flood event... then you'll get a chance to see the power of the river and the stop gate in action. And while you're here, look for other canal engineering features. There are numerous important canal features located upstream of the stop gate, and they're all highlighted in the points of interest section below. An easy 8 mile bike ride will take you past all of these structures.